People who work remotely at least once a month are 24% more likely to feel happy and productive in their roles than those who don’t or can’t work remotely. This is according to Owl Labs’ 2018 Global State of Remote Work survey, which polled more than 3,000 workers across 23 countries to analyze how they think about remote work. The top reason people in the U.S. choose to work remotely is increased productivity and better focus, which surpassed last year’s No. 1 reason of improved work-life balance. Respondents in North America are the most likely to work remotely to avoid a commute compared with other continents, yet are the least likely to work remotely to save money. 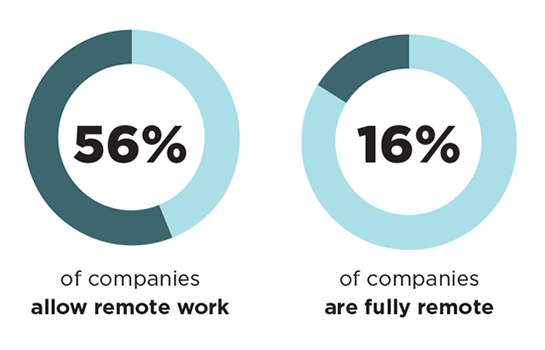 Owl Labs’ data shows that 56% of companies worldwide allow remote work, so-called “hybrid companies,” or are fully remote. The concept of a hybrid company has become increasingly common in the U.S. In 2017, Owl Labs found that companies offering remote-friendly options have 25% less turnover than those that do not. More than half of respondents in North America occupy “individual contributor” roles, and more than 25% of North American respondents work in government or education. Eight percent of respondents work in technology and marketing.